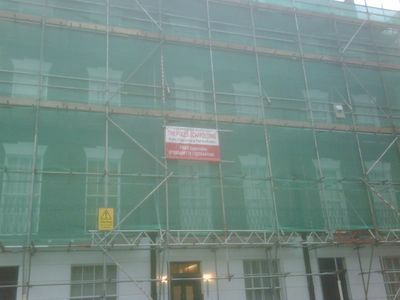 Here's what the front of our building's gonna look like for the foreseeable future. Granted, the boys put it up pretty quickly, and I'm not home during the day anymore to hear the clanging and pounding. But you know what I like best about the company in charge of my building's erection? No misplaced apostrophes. Do you know what a rarity that is in London? 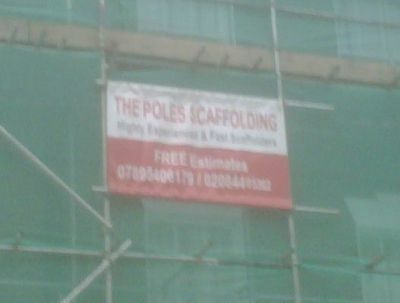 Suffice to say ... yes, the workman were Polish (hence the clever company name) and no, there were no "can I help you with your pole?" or "would you boys like to come in for a cool drink" moments. We're classier than that these days. But it is kind of an eyesore, no? The view could be worse, I reckon ... at least I don't have to look at that mess (the backyard, not the neighbor) anymore.